We’ve got 50 car stickers to giveaway*. Simply send us your address and we’ll post you one completely free of charge! Put it on the inside of your car window and show your support! 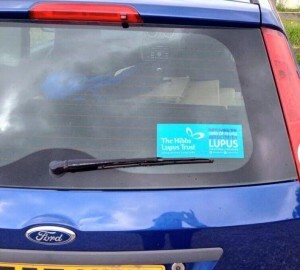 We want to see as many cars out and about with the sticker on them as possible. Raising awareness is a way of life. *We are only able to post these free to UK addresses. I am a lupus sufferer and would see it as an opportunity to start conversations which would help raise awareness of the condition. I have Lupus and my daughter is being tested at the moment too. Send us your address & we’ll send you all one!